I couldn’t wait to enjoy my last few hours in Paris before heading back to Florence. It was a perfect spring day with the sun warming up the cool air. I walked down the rue de Grenelle, where I was staying, to the Invalides. Boys were playing soccer on the grass and tourists were navigating the streets with their maps opened as they walked along the large sidewalks of the esplanade. I cut through the soccer game along the stone walkway that cuts the grass diagonally to get to the métro station. Instead of taking a métro, I hopped on the RER to Saint Michel. I wanted to see the Notre Dame and the Seine before taking off. The first thing I saw in Paris when I arrived two weeks ago was the Notre Dame, and I thought it’d be good to end my trip with it as well. I thought all the shops would be open by 10am, but most of them didn’t open until 10:30. I strolled down rue Saint-André des Arts. A large garbage truck made frequent stops to empty the green trash bins lined up along the street and a street cleaner was sweeping the sidewalks with his broom and water bubbling up out of the ground. It wasn’t until I headed back toward Notre Dame on rue de la Huchette that I was reminded of Florence. All the touristy shops with all the different ways to get an image of the Eiffel Tower on mugs, t-shirts, scarves, and much more. In Paris, the Eiffel Tower represents the city best. In Florence, there are a few, but probably the most recognizable is David. Usually when I’m walking past the touristy shops, I see him plastered on aprons, t-shirts, and boxers. 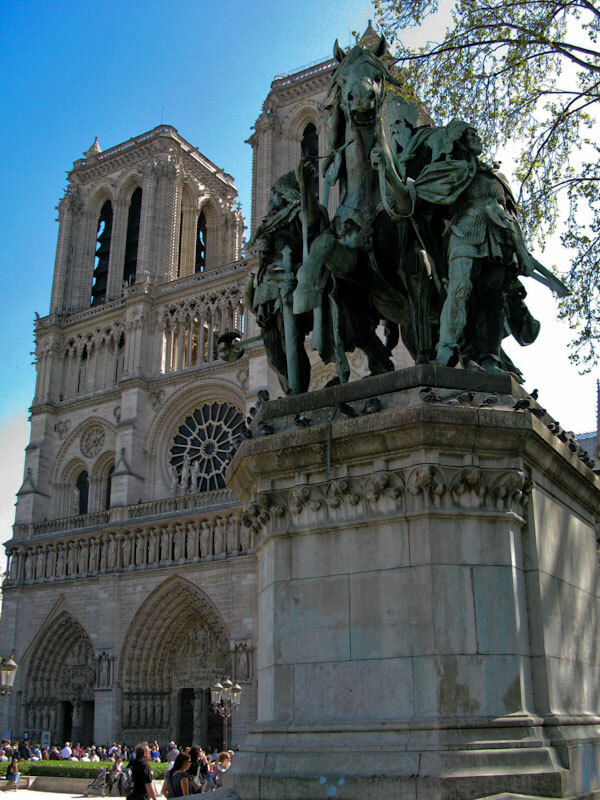 I crossed the Quai Saint-Michel to stand in front of the Notre Dame, which I didn’t get to do the last time I was there. I gazed at the church and watched the crowds of people going in every direction around, to, and away from the church. I didn’t enter when I saw the long line, but did walk behind it where flowers were blooming in small patches of green grass. My favorite part was standing on the Petit Pont to see the Seine pass below my feet. It made me miss the Arno. Before taking the RER back to my apartment, I went to Shakespeare and Company again to get a book. I finished reading the books I brought during my two weeks in Paris. Besides my nightly reading, I also read on the métro. It didn’t matter if I had a seat or not, I would pull out my book and read. It was one of the greatest perks of taking the 20 minute ride to work each morning and evening. When I got back to the 7th, I ate lunch in a quiet brasserie on rue du Champs du Mars, which is a side street off of rue Cler. I initially walked down rue Cler, but wasn’t interested in sitting on the sunny terraces packed with people. It was a little too overwhelming and noisy for me. I just wanted a calm meal before taking off. My trips to Paris seem to go by so fast. It wasn’t until I was in the taxi on my way to the airport that I realized I was going back to Florence. It’s odd at times to go somewhere else to live for a couple of weeks. I get settled in and then I have to go again. Just when I was getting my rhythm, I have to change again. Life is continually nudging me to not be stagnant, and I’m doing my best keeping up.